Recently I was given 95 rounds of 32/20WCF that I was very grateful to receive. I'm not one to turn down free ammunition, but the only problem I had was that I didn't own a rifle to shoot it from! This was clearly a perfect example of a first world problem and the only solution was to purchase a suitable rifle. I scoured the online used gun classifieds until I found a CBC 151 break action that was within my budget. It was cheap because the timber work looked quite shabby and it was missing the rear sight. Growing up in a family of full bore target rifle shooters, I have grown quite fond of peep sights and I explored all the various manufacturers such as Lyman and Williams. The problem is that there is no way of fitting a receiver mounted peep sight on a break action without it getting in the way of the loading/unloading process. I thought I was going to be doomed to fitting iron sights to this rifle so I conceded defeat and started looking at the options available. Marble's Sights was the first sight manufacturer that I looked at. 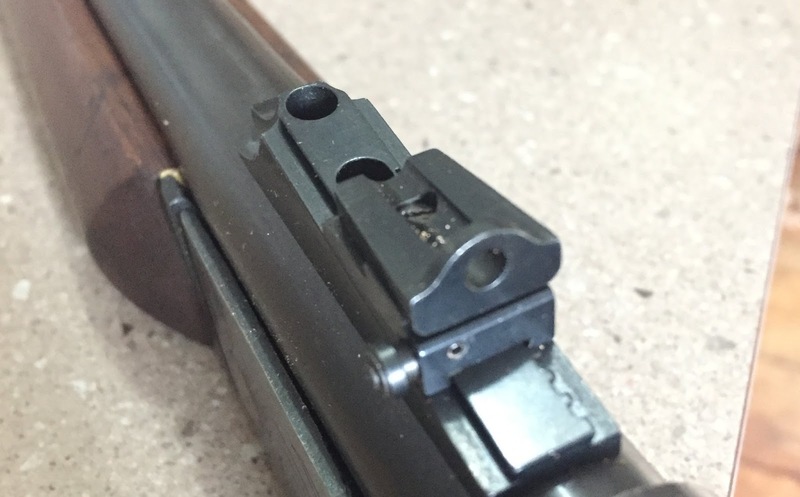 They have a wide range of sights available but the one that caught my eye was their barrel mounted Universal Rear Sight with an option for an interchangeable peep upright. I had hit the mother lode! Marble's offer two different sized peeps for those that prefer a small aperture whilst target shooting and also a larger more suited to hunting. It's a matter of personal preference of course. Not knowing which one I would prefer, I coughed the dough for both. At this stage I have only used the large and I am quite happy with the sight picture. Different sizes are available to accommodate small, medium and large diameter barrels. Marble's also offers a sight with a flat base that would be suitable for hexagonal barrels. I also purchased a front sight ramp with dovetail and orange fibre optic sight but I haven't had them fitted to the rifle at this stage. I am certain that this addition will make an already good sight picture even better. Elevation is easy to adjust thanks to a push button system that locks the sight at your desired height. Windage adjustments are made by loosening a flat blade screw and sliding the upright within its carrier. It didn't take long to have this rifle sighted in at 50 yards using light lead loads and before long, the 4" gong was singing a regular metallic tune. This will be a great daytime farm gun for all of the small critters that need to be injected with lead. 75 yards would be the most practical distance to zero this rifle for its intended purpose which means I'll have to shoot it some more. Bonus! Keep on burning powder y'all!